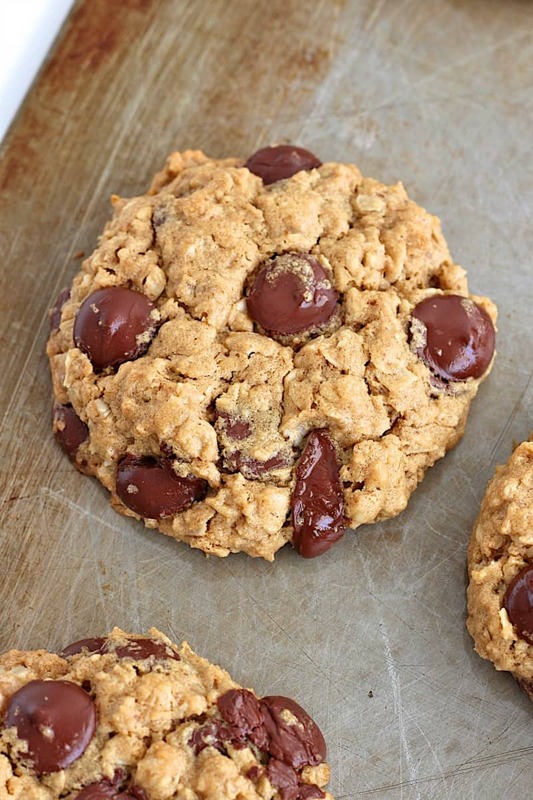 You’d never believe these chewy oatmeal chocolate chip cookies are baked with no flour. Yummy yum! I’ve been craving oatmeal like crazy these last few months of pregnancy. Whether it’s in a bowl as a healthy breakfast or baked into cookies for a sweet treat, I want all the oatmeal. It’s comforting, filling and delicious! I was in the mood to bake cookies one afternoon, but wanted to see if I could pull them off without flour for once. 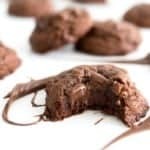 Since I use flour in most of my baked goodies, I thought it would be good to have a great cookie recipe that I can bake or share with others that can only eat gluten-free. I was certainly skeptical on how they would taste and hold together, but the first try turned out pretty great! I honestly couldn’t believe I hadn’t put any flour in them. We (okay, mostly me) gobbled that first batch up pretty quickly, so I baked them again with a few adjustments to the sweetness and overall flavor. And they turned out perfect! I might even venture to say they might be one of my new favorite cookies. I can’t get enough of them! 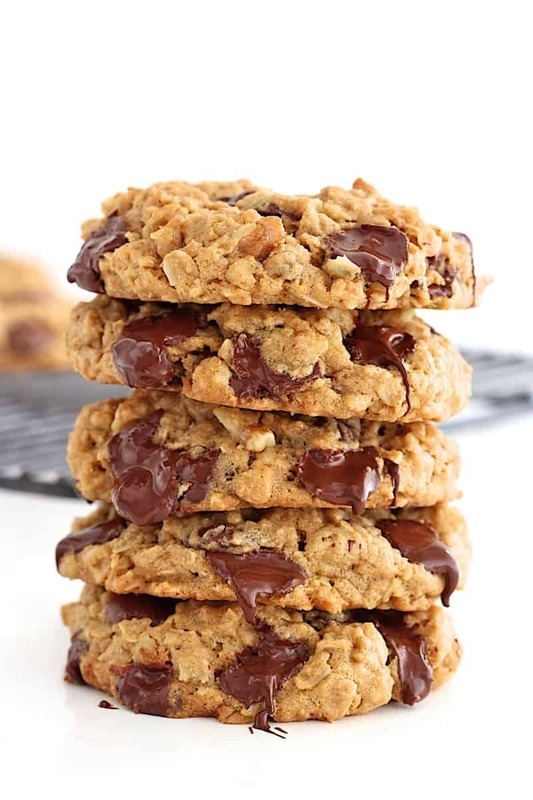 They’re chewy, chocolaty, and have the most delicious flavor and texture from the peanut butter, oats and walnuts. I’m in love! 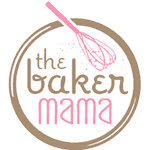 And lucky us, I got to bake them again to share with y’all here on the blog. 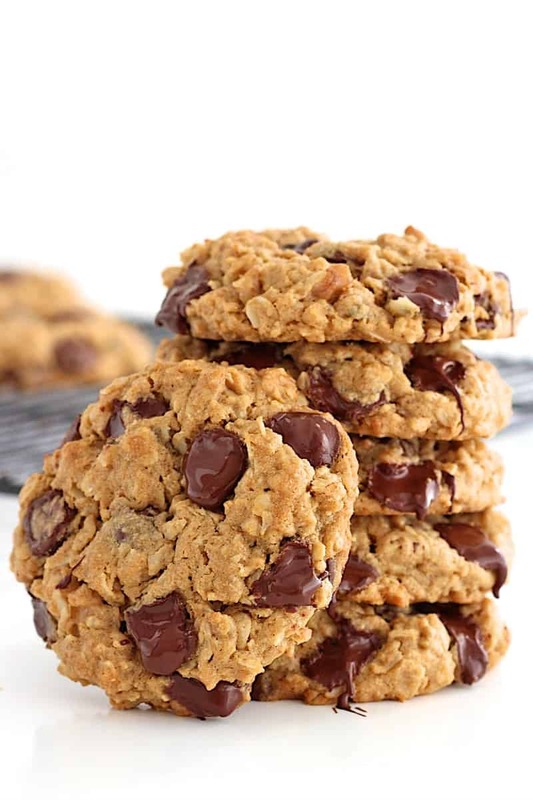 They’re so easy you can have these warm chocolate chip oatmeal cookies ready to eat in less than 30 minutes. I used Ghirardelli 60% chocolate chips in these cookies and would highly recommend them. They have such a rich chocolate flavor and they stay smooth and melty well after the cookies have cooled. I hope you get a chance to bake and enjoy these yummy cookies soon. They’re amazing! 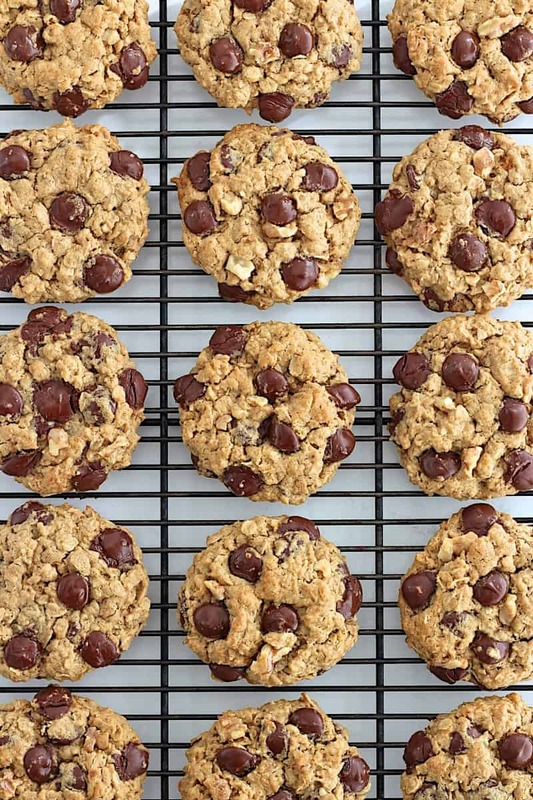 You'd never believe these chewy oatmeal chocolate chip cookies are baked with no flour. Yummy yum! In the bowl of an electric mixer fitted with the paddle attachment, beat the butter, peanut butter, sugar and brown sugar until smooth. Add the eggs and vanilla and beat until well combined. Add the oats and baking soda and mix on low speed until just combined. Stir in the walnuts and chocolate chips. 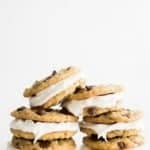 Using a 1 ounce cookie scoop, drop two-tablespoon sized portions of dough a few inches apart onto lightly greased or parchment-lined baking sheets. Slightly flatten the top of each scoop of dough with the palm of your hand. Bake cookies for 10-12 minutes or until golden brown. Let cool for 5 minutes on baking sheets before transferring to a wire rack to cool completely. I made these today! They were fantastic, thanks 🙂 I switched out the sugar for maple syrup and they still tasted amazing!! How much maple syrup instead of the sugar? can we use Hershey’s Baking Bar Semi-Sweet Chocolate chopped up or Semi-Sweet Chocolate chips?we arent big dark chocolate fans. Can these be made as a bar? And if so, what variations do I need to make?? Hi Tiffany! Absolutely, just press the dough into a 9×13-inch pan that’s been sprayed with non-stick cooking spray or lined with parchment paper. 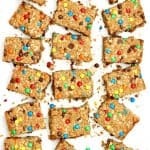 Bake for about 20-25 minutes or until the cookie bars look set and a toothpick inserted near the center comes out clean. Enjoy! Didn’t realize I was out of flour until after I told my 4 year old we were baking tonight! I feel like I made normal-sized cookies and my yield was 70. They are fantastic!!! Thank you for saving the night. And a follow up. Hubby says these are the best cookies I’ve ever made. Oh my, these are so delicious! They disappeared far too quickly!! Love that I have a gluten free cookie that my husband also loves! Is it possible to swap the white sugar for coconut sugar and swap the peanut butter for almond butter? Delicious! I actually substituted 1/2 cup real maple syrup (which my parents make and I currently have a super over abundance) for the sugars, and they turned out good! They’re lightly sweet and so tasty! Thanks for sharing! Is this cookies chruncy? or chewy? Hi Ugi! They’re chewy. Enjoy! Although I love peanut butter, I was considering making these w/out. Has anyone done this, and how did they turn out? Thank you. The peanut butter is key to this recipe or they will not turn out right. If you don’t want to use peanut butter, you will need to replace it with another butter. Beg to disagree. Nothing healthy about all that sugar and butter. These cookies are so thick and delicious. I want to sink my teeth in them! Just whipped up a half-batch real quick and they were so good and baked beautifully! I love how they’re just sweet enough. I used light margarine and milk chocolate chips purely because I had them on hand, but dark chocolate (my fave) would have been perfect. I almost subbed in some dried coconut flakes as I didn’t have walnuts and may have to try it out next time. Boyfriend loves them too! It shouldn’t be crumbly. Did you make any substitutions or are you using the exact ingredients that are called for in the recipe? My ten year old grandson, Noah, and I made these tonite. I made them small using my smallest scoop and it made 6 doz. They need to bake for 10 minutes only. Also, with the small scoop I used mini chocolate chips and chopped pecans. I also used a pecan half on top of each cookie which made it easy to press them down with the back of a spoon. They taste yummy and I WILL make them again. I just wanted to drop a comment saying, I used oat BRAN in these, and chocolate chunks, and they still came out really great. I’m slowly phasing out to paleo, and using up my grains; so I had to use up my peanut butter and my oat bran somehow, but my flour was one of the first things to run down. Great recipe. These looks delicious. I am going to make day and try to save a few to take on a trip next week. How long do you think these will last in an air tight container? Hi Liana! They’re best when eaten within 4 days of baking them, but still taste pretty good for about a week. Enjoy! *substituted the 1/2 cup of dark brown sugar and 1/2 cup of granulated sugar for 1 cup of packed light brown sugar. *chilled the dough in the freezer for 20 min, returning to freezer in between batches. They turned out deliciously fluffy, soft, chewy, filling, with just the right amount of sweetness! I make these with gluten-free oats. Because I oven-toast the oats before using, I add enough apple sauce for the right consistency. I don’t change anything else. Delicious. Wonderful recipe. And, hey, if you have a brain fart while making half a recipe and accidentally add the entire original portion of sugar they make great oatmeal cookies. Simply substitute raisins for the chocolate chips. i made these cookies and they are AMAZING!!! my whole family ate them up in one night! i was wondering you knew or could guestimate the nutritional facts for this recipe? So. I made these cookies, and substituted vegan butter and chocolate chips for their dairy counterparts, and Let. Me. Tell. YOU! These were the absolute best cookies I’ve ever made! Thank you so so much for this awesome awesome recipe! You’re amazing! I just made these for tonight’s dessert, but the kids and I did some mid-day quality control. Good stuff! Love it, Bethany! Quality control is always necessary. 😉 Enjoy!! Delicious and I added raisins for a little extra sweetness! Is there a trick on how to store them? I usually use bread to keep cookie moist. But I am trying to keep these gluten free. Hi Ren! I store mine in a plastic container with a tight fitting lid and they store great. Enjoy! I’m currently hiding from my toddler trying to eat a few cookies without him seeing me. Not sure what I did wrong. I used coconut oil instead of butter because I can’t have dairy. The only other substitution was I had to use instant oats because I was out of old fashioned rolled oats. They are incredibly dry and crumbly. Going to have to dunk them to eat then. Do you think it was the instant oatmeal that was the problem? Hi Stephanie! The instant oats definitely absorb more moisture so that will certainly have something to do with it. Also, I’ve found that I need to use a little more coconut oil in some recipes when I’m substituting it for butter. I haven’t tried coconut oil in this recipe, but that could be part of the cause as well, especially when using instant oats. Hope this helps. Thanks. I can’t wait to try. this was EXACTLY what I wanted to know just now..love this website. just found it. Stumbled across this recipe, of course on Pinterest and figured it might be good to try to curb my craving for sweets and baking. Made a batch last night and realized I had forgotten how good peanut butter and oatmeal are together, then throw in the choco chips and WOW. Now I have a potential gluten free recipe to throw in the mix. Thanks, it was a hit with the family too! 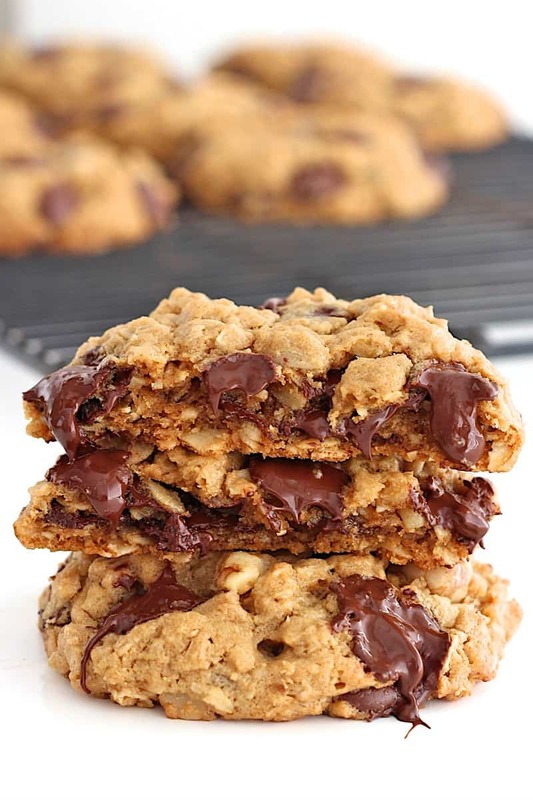 I was looking for a flourless peanut butter oatmeal chocolate chip cookie recipe today and found yours. I followed the recipe and wow, they are awesome! My daughter and I both decided we have a new favorite cookie. The reason I was looking for such a recipe was to mimic the gluten free Girl Scout cookie trios. My nephew is gulten free and just ate 6 bags of the Girl Scout cookies. I thought I want to try to make something like that. Your recipe is a perfect substitute, and actually even better. 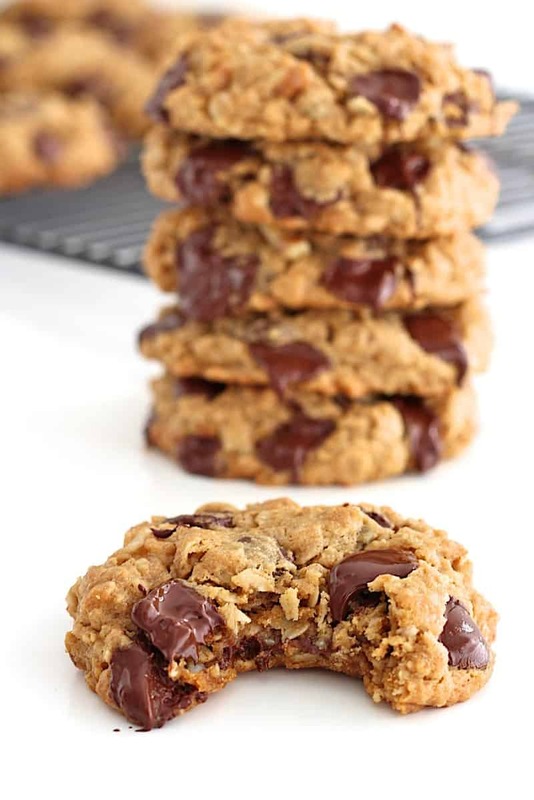 I think it would be nice to experiment with the recipe and make peanut butter oatmeal cinnamon raisin cookies too. Thank you for sharing your recipe. Yay, Mary! I’m so glad you love these cookies as much as we do! They do make for a great gluten-free cookie. Enjoy! Absolutely fantastic. Out of butter so I used shortening & (to my great sadness!) I have no chocolate chips or walnuts. HOWEVER I made them with Adams crunchy peanut butter & unsweetened coconut flakes & my hub & toddler loooove them. Can’t wait to try with chocolate, and literally thrilled I can make something without any flour (gluten free flour & I are friends off for the moment LOL). These are seriously some of the best cookies I’ve ever baked! Thanks for the fabulous recipe! Yum! This is the second time making these and they are so good. I like them better with raisens. Delish! This is the third time making them if that tells you anything . So good! Thanks! I just made these and they are so good!!! Was out of butter so substituted it for 1/2 cup of applesauce (I used cinnamon because that’s what I had) and they turned out great. Great way to make them a little bit healthier/cut down on calories. Also, definitely would spray the cookie sheet before baking, and I would not flatten them before they bake. When I flattened them, they did not hold together very well after cooking. Either way, great recipe! I just made these. So simple and delicious. Thank you for the recipe. My family loves them. I make these cookies all the time and my whole family loves them. I cut the sugar to 1/3 cup white and 1/3 cup brown and they still taste great. They also freeze well! Will the cookies turn out OK without the walnuts? And would butterscotch chips be a good alternative to the chocolate? Great flawless recipe, I used vegan butter and unsweetened peanut butter and they baked amazingly well. I will probably add a pinch of salt to my recipe though. Love it! Thank you. OMG! I made these cookies last night and they are amazing. My fam and I had doubts that the cookies would be this good. I did a couple of things differently, I do not have a mixer and it was so thick so I added a little soy milk to the mix and mixed with a big spoon. Also, I made some cookies that were Oatmeal Chocolate Chip Coconut and Oatmeal Chocolate Chip Craisin (my fiances request). They all came out so good and nice and chewy. Like you I pretty much at the first batch straight out the oven. We will be making these again. Hi there! Making these for my GF boyfriend, just wondering if I can use the usual peanut butter we buy which is the kind you have to stir, or would that be too runny? When you say creamy, do you mean like the no-stir thick type? Hi Elizabeth! Great question. 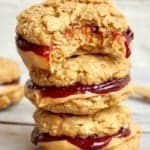 I do usually use the no-stir creamy peanut butter, but I have used the runnier peanut butter and even almond butter and they still turn out great. If you feel the cookie dough is too dry when using it, add an additional 1/4 cup peanut butter. Hope this helps. Enjoy! These cookies are delicious and will definitely be added to my list of favorites. I used coconut oil instead of butter and a mix of almond butter and sunflower seed butter in place of peanut butter. Next time I think I’ll add salt and cinnamon. And ( I can’t believe I’m saying this) I’ll use less chocolate chips. Thanks for the recipe Megan! Do you recommend to use the old fashioned oats and not instant oats? Would there be a big difference? Can’t wait to try this recipe! Looks delicious! Hi Chris! I don’t recommend baking with instant oats because they are cut too fine. You could replace the old-fashioned oats with quick cooking oats which would still give the cookies great texture and taste. If using quick cooking oats, you might want to reduce the baking time by a few minutes. Hope this helps. Enjoy! Hi Millie! Aww, thanks so much for sharing. I’m so happy to hear you love my flourless brownie recipe as much as we do. For these cookies, you’ll want to use something else in place of the peanut butter for the cookies to turn out. I’d recommend replacing it with more butter or another nut butter. I hope they turn out just as great for you. Enjoy! Absolutely wonderful!! I used white chocolate chips and Almond extract (I was out of vanilla) and they turned out incredible!! I cannot wait to make these again!! OMG!!! Oatmeal chocolate chip cookies are the only cookies I love/make. This is my new favourite recipe. You’d never know there was no flour!!! Thanks a million!!! 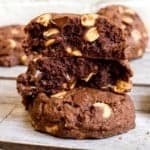 I came across similar cookies at our local farmers market and loved them so much I figured I try making them myself using the best ingredients I could find and the closet recipe to match them. Using this recipe, It turned out to be one of the best cookies I have ever had. Even my father was impressed. As his son I can tell you this is not easily achieved. By the look on his face it seemed I had really made him proud. LOL. A wonderful recipe which makes even better cookies. In honest conversation and in all Truth I am grateful for the entire experience. Absolutely delicious! I used hazelnuts, as I didn’t have any walnuts handy, but they were lovely. I googled recipes for wheat-free cookies and thought this recipe looked good. So glad I tried it and will definitely use again. Many thanks. Can we use sweetener instead of sugar at all? Need a way to make these sugar free. Thanks. Hi Lucy! I’ve never baked with sugar-free sweeteners so I couldn’t say for sure how they would turn out. These were so yummy! However, though still chewy, mine turned out really flat/thin. Any reason this could be? Followed the ingredients exactly but I used vegan baking butter and didn’t use walnuts. Hi Chelsea! It must be something to do with the vegan butter as these cookies have to be flattened or else they won’t spread much. I’ve never baked with vegan butter so I can’t say for sure what you could have done differently to prevent the spreading. My first thoughts would be not to press down on the cookies before baking and maybe even refrigerate the dough first. Hope this helps! Made these tonight for the first time. Added Reese’s Pieces to them also. So good!! Will definitely be making again! Hi, is 1-1/2 teaspoon bakingsoda 1 and 1/2 ts? I am planning to make these tonight and just want to make sure! Already excited for these cookies! Hi Laura! It’s 1 and 1/2 teaspoons. Enjoy! I made these per the recipe save for substituting almond butter instead of peanut butter (as that’s what I had on hand). They were fantastic! My husband was a huge fan and insisted this go in my recipe book. Thank you so much for posting! O to the M to the G! Thank you these are outrageously yummy. Plus less sugar and carbs than “regular” Choco cookie recipes. Thanks thanks thanks thanks. I took a new twise on banana nut bread after trying tour take on no flour in chocolate cookies and made the bread with the oats it turned out very well thank you so much. Hi- Will these turn out ok if I add brewers yeast and ground flaxseed to make them lactation cookies or will that ruin the consistency and flavor? Thanks! Oh my goodness!!! These are delicious. We made these tonight and are probably my favorite choc chip cookie. You won’t even miss that there is no flour. Hi Debra! 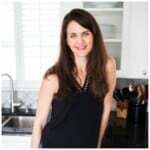 I don’t provide nutritional information at this time because everyone uses different brands of ingredients which often have differing nutritional values. I would recommend plugging the ingredients you use into a free online nutrition calculator like: http://www.myfitnesspal.com/recipe/calculator Hope this helps. Enjoy! Just made these delicious!!!. I didn’t have smooth peanut butter so I used chunkey and omitted the walnuts. Great for me being celiac. My daughter can not have wheat, dairy, or soy. I made these with some vegan, soy free butter and mini chocolate chips. They are awesome! I could have eaten the whole batch myself. You’d never know there were flour/gluten free, they taste so good! Hi, I made these tonight with semi sweet chocolate chips and sunflower seed butter and my husband LOVES them. I was making them for a cookie exchange tomorrow but my husband won’t let me. HEHE. I have to make more for the exchange. Thank you!!!! They are great!! I also have a 2 year old grandson that has to eat gluten free. My daughter doesn’t want to give him too much peanut butter so the sunflower seed butter is a great swap. Tastes a bit different than PB but it’s a great substitute. Great recipe. I didn’t have walnuts so I used pecans instead. I really love how easy these are to make and that I didn’t have to grind up the oatmeal into flour which so many gluten free oatmeal cookies require. The taste wonderful, I would add maybe another egg and make a square out of it next time! Oh goodness! Sounds like you might have over-baked them. Did you follow all of the ingredients exactly? OMG!! I just made these cookies and they are absolutely delicious. I swapped out the white and brown sugar, and used 1/2 cup maple syrup instead. Thank you so much for this wonderful recipe! !